Create lifelong memories at this adorable cottage perfectly located in the private community of Magnolia Cottages by the Sea on 30A. Relax in the newly redecorated living area with comfortable, cozy, beach furniture and décor. Access the gorgeous, uncrowded beach via a short two-minute stroll down a quiet paved street. Enjoy the heated neighborhood pool located just a 30 second walk away. Stay among all the 30A action without the chaos of a crowded community. Charming Rosemary Beach is just two miles East, and Seaside Beach is five miles West of Magnolia by flat, paved pathway making them accessible on foot or bike. Include your non-shedding dogs on your vacation. You and your best friend will enjoy walks or runs in the neighborhood or down the beautiful 30A bike path. Accommodate up to eight guests in 3 bedrooms and 3 baths with hardwood floors throughout, as well as custom trimmed doors and lots of natural lighting. Large screen TV in living area. Flat screen TV and DVD players in all bedrooms. Wireless, high speed Internet access throughout the cottage as well as a wireless printer. Bluetooth stereo speaker connects to your music device or phone in the home or on the porch. 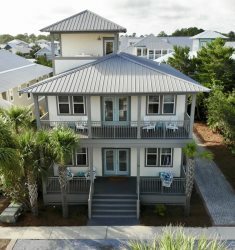 Prepare meals or drinks in the well-equipped kitchen featuring stainless steel appliances, granite counter tops, Keurig and traditional coffee makers, or grill locally caught seafood on the gas grill. You’ll have everything you’ll need to feast at home. Open concept kitchen, living, and dining area. Seat ten guests for meals at the dining table (6) and breakfast bar (4). Access the quaint porch and lush, peaceful surroundings just off of the living/dining areas. Comfortable king size bed with matching end tables and a cozy leather club chair with ottoman. Beautifully decorated with French doors that provide access to the upstairs terrace with loungers to enjoy the sunrise or quiet time. Bathroom offers a double vanity with a tub/shower combination, tiling throughout, and access to the terrace as well. Flat screen TV and a Roku device housed in an armoire offering additional storage. Walk-in closet with ample storage space and extra pillows and blankets. Located just off the kitchen. Queen size bed with new bedding. Private single vanity provides generous counter and storage space and a tub/shower combination. Flat screen TV/DVD combination unit. Two sets of twin bunk beds. Dresser with plenty of storage. Closet full of games and additional storage. Access to the third bathroom right across the hall with a single vanity, glass shower door, and tile flooring. Rinse off the sugar white sand in the outside shower located near the side entrance. Launder your clothes and beach towels in the high capacity, high efficiency washer and dryer. Share beach toys and chairs from the deck box on the front porch. Settle in at the beach with a drink cooler and beach bags, blankets, and towels stored in the laundry for your convenience. Take a break from the beach to enjoy the resort style, heated swimming pool, feel safe riding bikes, walking or playing in the neighborhood, or explore the many possibilities along beautiful 30A. Dylan was wonderful during the booking process and made sure we were thoroughly informed of each and every step necessary to complete our booking. As a property manager, Will was spot on...each call/text to him was answered within minutes! Thank you! This home spoke to our soles...it was a perfect beach home match! I worked with Tara and very pleased with her. I would recommend the property very highly. In a good neighborhood and felt very safe. Close to good restaurants and the ocean. a welcoming and homey feeling. the kitchen and beach supplies were ample. beds all very comfortable. Loved the string lights on porch.